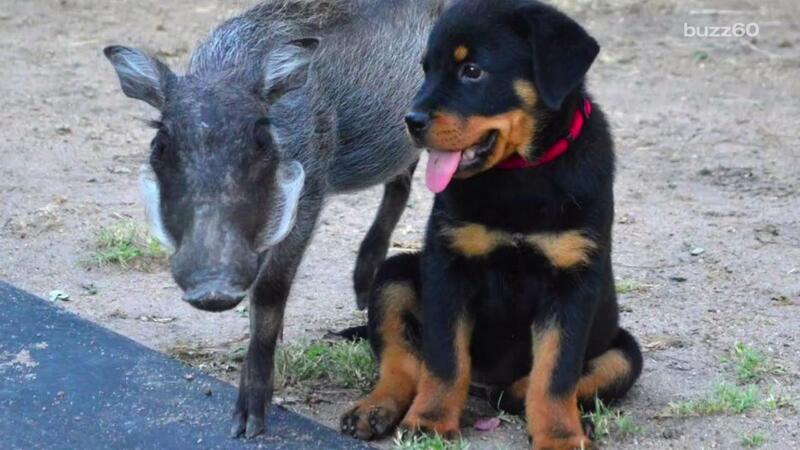 Rottweiler Puppy and Orphaned Warthog Are Best Friends ! 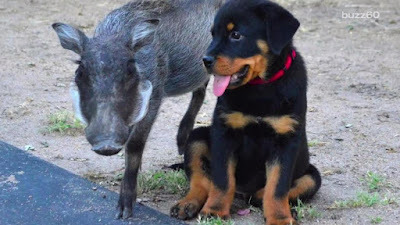 A cute Rottweiler puppy named Nikita became the best friend of Piggy, an orphaned warthog. Piggy was one of three baby warthogs who arrived at Daktari, South Africa in 2014. A lady found the three warthog babies living in a drain near the road. She gave the babies warm milk, and left them where they were, hoping that the mother would come back but unfortunately the mother didn't came so the lady contacted Ian Merrifield, a co-founder of Daktari (a wildlife orphanage and school) to come and pick the warthogs up. Even though the people at the Daktari center gave the warthogs the best care, two of the warthogs died after arriving at the center, while the other warthog named Piggy surprisingly managed to survive. 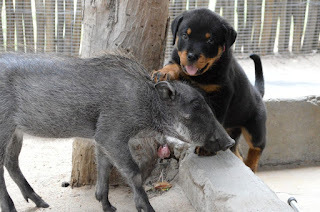 A Rottweiler puppy at the center helped the people to take care of the warthog, the dog and the warthog became inseparatable. Even though the rescue was worried Piggy was too weak, Nikita the Rottweiler quickly nursed him back to health, despite being a puppy. The Rottweiler puppy Nikita even took a motherly role with Piggy. According to Ian, Nikita would stimulate Piggy's backside to help him do his business. Fortunately after growing up Piggy was healthy enough to be released to a local game reserve last year, and despite their irreplaceable friendship, the shelter is happy to report that the warthog is thriving.